If you're obsessed with relaxed dressing when it comes to fashion, you'll love this adorable pairing of a grey coat and beige knee high socks. Black rain boots will add a more relaxed feel to your outfit. If you're obsessed with relaxed dressing when it comes to fashion, you'll love this super cute combo of a tan shearling coat and Polo Ralph Lauren slouchy knee high socks from Ralph Lauren. Got bored with this look? Enter mustard suede lace-up ankle boots to switch things up. 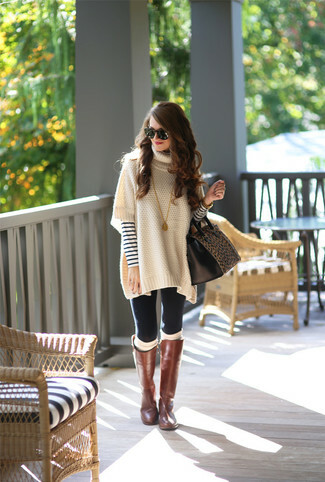 If you're all about comfort dressing when it comes to fashion, you'll love this stylish pairing of a white knit oversized sweater and Polo Ralph Lauren slouchy knee high socks. Throw in a pair of brown leather knee high boots to kick things up to the next level. If you're all about relaxed dressing when it comes to your personal style, you'll love this uber cute pairing of a beige coat and Polo Ralph Lauren slouchy knee high socks. Throw in a pair of brown leather knee high boots to instantly up the chic factor of any outfit. If you're obsessed with relaxed dressing when it comes to fashion, you'll love this cute pairing of a beige poncho and beige knee high socks. Grab a pair of brown leather knee high boots to instantly up the chic factor of any outfit.